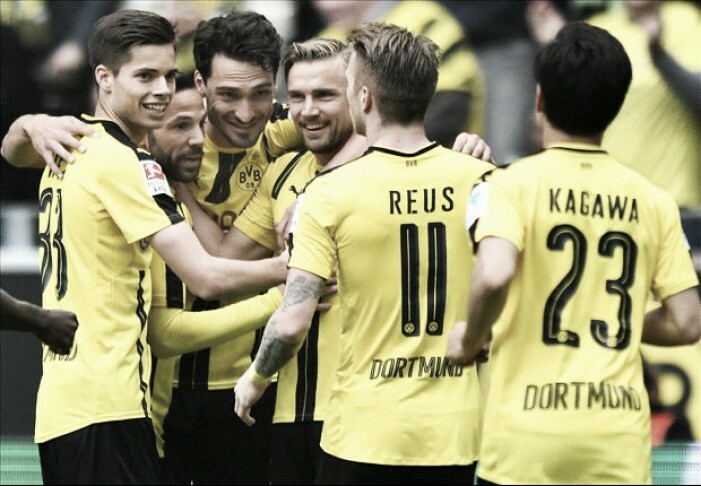 A late free-kick from Marco Reus saved Borussia Dortmund's unbeaten home record this season as they drew 2-2 with 1. FC Köln. 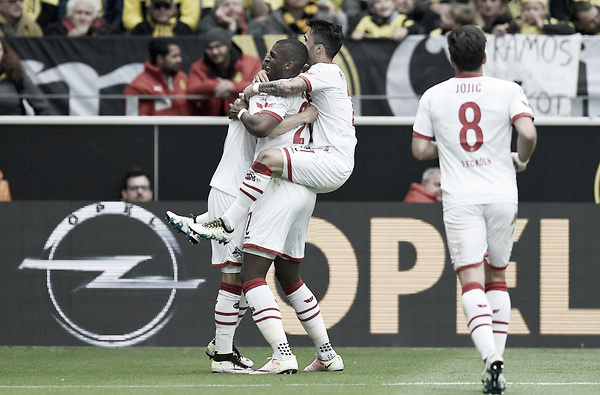 It was an electric opening 45 minutes from both sides at Signal Iduna Park with Gonzalo Castro giving the home side the lead before Anthony Modeste equalised and former Dortmund player Milos Jojic gave Köln the lead just before the break. The second period wasn't played at quite the same break-neck speed with just two half chances from Leonardo Bittencourt, Pavel Olkowski and Modeste but Reus' free-kick saved a point for Thomas Tuchel's side. Tuchel's side started brightly in the final game of the Bundesliga season and found themselves ahead in style just 11 minutes into the contest. It was poor defending on behalf of their opponents as they allowed Castro time on the ball and he used it well as he had the time to compose himself and curl it in at the near post from distance much to the dismay of Köln keeper Thomas Kessler. Peter Stöger's side had a golden opportunity to equalise just four minutes after falling behind when an over-the-top ball found it's way to Jojic who was one-on-one with Roman Bürki but he managed to put wide on his old stomping ground. Köln have developed a never say die attitude under Stöger and that shone through once again as they equalised just before the half hour mark. Forty seven percent of the Billy Goats' goals this season have involved Modeste so it was no surprise to see him strike again when a quick break resulted in a great through ball into Marcel Risse and it was simple enough for him to play the low ball into Frenchman who made no mistake from close range. 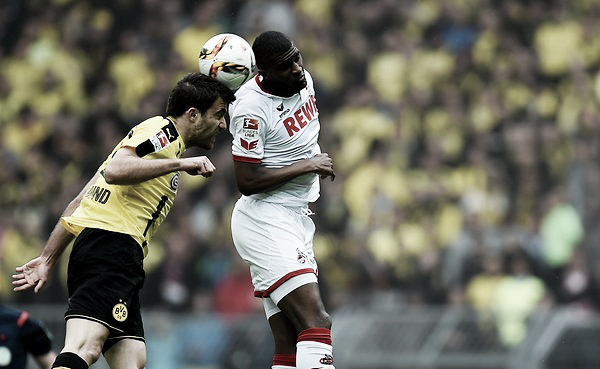 Dortmund had two great chances to get themselves ahead once again as the half began to come to a close. Castro was allowed time once again to compose himself and decided to hit one from distance but Kessler was equal to it this time around as he tipped it over the crossbar. He was on hand again just minutes later when Pierre-Emerick Aubameyang brought the ball down and was one-on-one but the keeper did well to rush out and smother any attempt and eventually cleared their lines. Jojic made up for his earlier howler in some style as another quick break from the visitors as another former Dortmund player Bittencourt playing a great ball over the non-existent Dortmund defence and Jojic coolly chipped the ball over the head of the rushing Bürki and into the net. The second period couldn't live up to the standards set by the first but the visiting side had some good opportunities to put the game out of sight. The first came just after the hour mark as a superb ball into the danger zone managed to find Bittencourt whose touch was poor but did well to get the shot away but Bürki did well to stop the effort even when the flag was raised for offside. The second came bang on the 70th minute as Köln proved deadly on the break as Bittencourt broke down the wing before playing in goalscorer Modeste who looked to toe-poke it into the bottom corner but Bürki was hand again to turn it away. Dortmund had failed scored a free-kick since Robert Lewandowski's effort on the final day of the season two years ago but found the perfect time to break that duct as they managed to equalise in style. Reus has taken over the mantle since the departure of numerous big names and was at it again as he did well with his free-kick on the edge of the area to dip it into the bottom corner to keep their excellent record at the Signal Iduna Park intact.